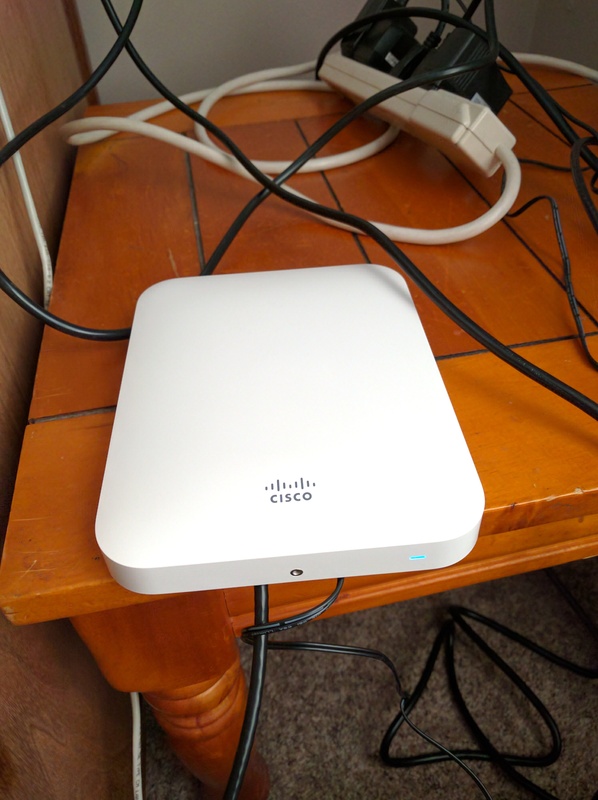 I recently received a free Cisco Meraki MR18, so I decided to set it up in my lab. First of all, this is definitely a sleek-looking AP, even without mounting it. This replaces my old Asus RT-N56U, so it is a noticeable improvement in both speed and configuration. Note that while the MR18 has a layer 3 firewall and DHCP server, it won't handle wired routing. I ran into this issue initially when I tried to hook it into my dumb switch along with my modem. My wireless clients connected to the internet just fine, but my desktop was unable to. Once I put my RT-N56U in router only mode (just disabled both radios), everything was back up and running. This is only my temporary solution until I finish my pfSense box, but it works for now. The first thing I noticed with this device is that the cloud-based dashboard is awesome. While it is overkill for a small (or home) office, the MR18 is super configurable and data rich. I can view usage across the network (in MB/sec), which would obviously be more useful in a corporate environment for bandwidth usage or rogue connections. It is also nice to see what clients have connected to the AP. The dashboard will also list how much data they are using, as well as standard stuff like OS/IP address. There are a ton of configuration options, but I especially liked the options for multiple SSIDs and Rogue AP detection. That said, unfortunately, there is no one-click setup for a guest network on this AP. Cisco has provided a guide for this, but I haven't set it up yet. My favorite statistics are the application specific breakdowns though. There is a pie-chart displayed, as well as a sortable table, of how much data each application is using on the network.